This song from Raj Kapoor’s movie BOOT POLISH emphasize that children are the treasure of a nation. 14 November marks the birth anniversary of India’s First Prime Minister Pandith Jawaharlal Nehru, who adored children and believed that children are the real wealth of any country because he taught children are the future and have dreams and aspirations to make the country powerful. Since his birthday is celebrated as Children’s Day; Raaga.Com salutes top five child artists from Indian Cinema who brought pride to the nation. 1. Kamal Haasan: The child artist who tops the list is unarguably Kamal Haasan, who rose like a phoenix from South Indian Cinema and won acclaim not only in India but around the globe. He made his debut as a 4-year-old child artiste, in KALATHUR KANNAMMA (1959) opposite veteran Tamil actor Gemini Ganesan. In his very first film he won the prestigious National Film Award for Best Child Artist and made his arrival with a bang. 2. Aamir Khan : This sensational Bollywood actor occupies second position in the list. Though Aamir Khan played a cameo in his uncle Nasir Hussain’s hit film YADOON KI BARAAT, yet from the very film he has shown the glimpse of an polished actor. At a young age 23 in QAYAMAT SE QAYAMAT TAK, when made his debut as hero he proved that he was here to stay. 3. Rishi Kapoor: In his debut film MERA NAAM JOKER, Rishi Kapoor did what none of the Kapoor had ever done before! 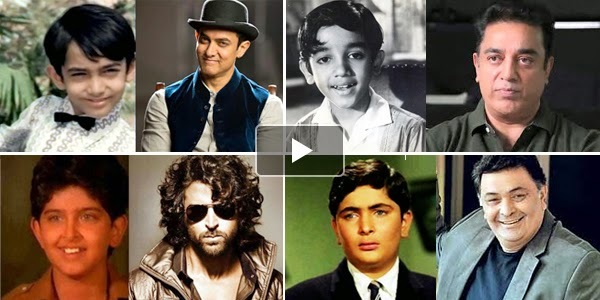 Well, he became the First Kapoor scion, to fetch the National Film Award for Best Child Artist. Later with BOBBY he once again won the Best Debut Actor Filmfare Award and established himself as an actor to reckon. 4. Sridevi: This South sensational heroine continued the trend of South heroines ruling Bollywood in the 80 and 90’s. She made her debut as a child actor at the age of four in Tamil movie THUNAIVAN playing the role of young Muruga and acted in many Tamil and Telugu movies from then on. As Baby Sridevi, her performance in POOMBATTA (1971) in Malayalam won her the Kerala State Film Award for Best Child Artist. In Bollywood she made her debut playing younger sister of Lakshmi in the hit film JULIE. Later with HIMMATWALA as Jeetendra’s heroine she became a national heartthrob. 5. Hrithik Roshan: His debut as a child star was accidental because while shooting the movie BHAGWAN DADA, the child actor to play the role fell ill. Hence filmmaker, J.Om. Prakash, Hrithik's maternal grandfather decided to cast his grandson Hrithik Roshan. The role was quite challenging as Hrithik had do many scenes opposite seasoned actors like Rajinikanth, Sridevi, Danny Denzongpa and his real-life father Rakesh Roshan. He excelled and so he did when made his debut as hero in KAHO NAA... PYAAR HAI.